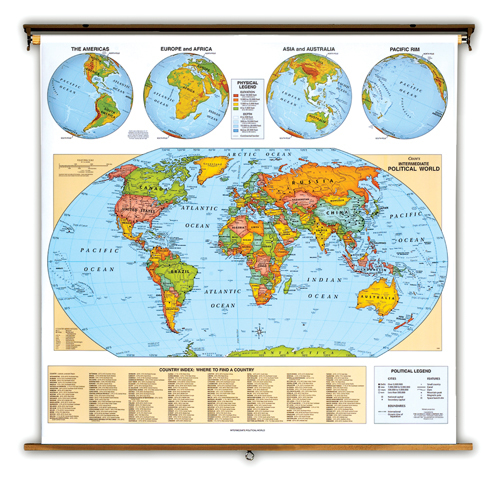 The Political World Map is a wonderful teaching tool for the social studies classroom. The map utilizes the Winkel Map Projection which is recognized as providing the best balance of size, shape, and direction? the most accurate map available! A physical representation of the earth is shown using the four inch ortho views inch at the top of the map. The index at the bottom of the map provides both an exact location and a relative location of every country. Printed on non-tear material, and mounted on heavy duty spring roller in brackets with backboard. 51 inch x 57 inch . Markable.